Wrongful Eviction of Illinois Nursing Home Residents | Hupy and Abraham, S.C.
You carefully chose a nursing home to care for your loved one. Medicaid paid the nursing home bills on time, and your loved one’s medical condition has remained stable since she was first admitted to the nursing home. You had no reason to suspect that your loved one would have to leave the nursing home unless you requested it. Then you got a nursing home discharge notice. You are not alone. In 2015, more than 9,000 complaints were filed alleging involuntary nursing home discharges. The Illinois long-term care ombudsman alone received about 1,000 complaints of involuntary discharge in 2015 which was approximately double the number that the ombudsman had received in 2011. In 2017, the Illinois long-term care ombudsman said that involuntary discharge was “by far” the most commonly received complaint investigated in the state. It is necessary for the resident’s welfare or health. It is necessary for the resident’s safety or the safety of others. The resident’s health has declined to the point where the nursing home can’t meet the resident’s needs. The resident’s health has improved to the point where the services of a skilled nursing home are no longer necessary. The resident has not paid for nursing home services. However, nonpayment is not a reason for discharge if the resident is waiting to receive Medicare benefits. The opportunity to make more money exists. A skilled nursing facility may not discharge a resident who is on Medicare in order to make room for a private paying resident. The resident’s needs increase. 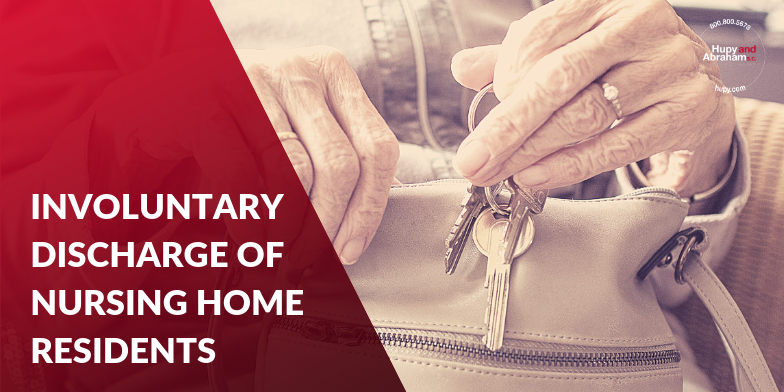 A resident may not be discharged because of changes in her health that increase her medical needs, as long as the nursing home is able to safely handle residents with that level of need. The resident’s family complains about the nursing home’s service or care. Family complaints are not reasons to discharge a resident. Unfortunately, some nursing homes do discharge residents for these reasons and the results can be catastrophic. Go without needed medical care or medications. Go without necessary assistance for activities of daily living. This can result in illness, a worsening of medical conditions, or even death in some circumstances. It can also create a significant burden for family members who are unexpectedly scrambling to find safe, affordable, and available nursing home care for their loved one after an involuntary and wrongful nursing home discharge. If your loved one was wrongfully discharged from an Illinois nursing home and suffered an injury because of it, then your loved one may be able to pursue a nursing home abuse and neglect case. Out-of-pocket costs, including costs associated with moving to a different facility or home. We encourage you to contact our experienced nursing home injury lawyers today to find out if your loved one might have a claim. We would be pleased to provide your loved one with a free consultation in a location that is convenient for her and we would be pleased to answer her questions. Please text us, call us, or email us at your convenience to learn more. ?Can my loved one file a nursing home abuse or neglect case in an Illinois court if no one reported the abuse to the state? ?How long do I have to file a nursing home abuse or negligence lawsuit in Illinois? ?Who can file a lawsuit for nursing home abuse or negligence in Illinois?